Legal Legends is providing solutions for SMEs who cannot afford legal services for their businesses. Describing itself as Africa’s, first legal eCommerce website, Legal Legends offers affordable legal services for entrepreneurs, start-ups and small businesses. Interesting enough and quite refreshing is the fact that their services are offered at fixed upfront prices. Service orders made through the platform are distributed among a panel of selected freelance lawyers for completion. A quotation is provided to the client before any work is done, building trust between the lawyer and the client upfront. Co-Founder Kyle Torrington says, “So we’re here to help the guys that traditionally haven’t been able to afford legal services but have a small amount to spend and we really want to help the start-ups formalise their businesses and become something really investable, something that an investor would have a look at and go ‘actually I like how this business has been established, they seem to be formalised correctly and I would like to invest in them’, which would take them to the next level.” Kyle likens Legal Legends as the Zando of legal services. “With the efficiencies that only technology can provide, and the associated reduction in the overhead costs required to run a business in the 21st century and still remain profitable, it is essential and incumbent on the legal profession to begin catering for the vast majority unable to traditionally afford such services, in order to finally ensure that every person’s constitutional right of access to justice is fulfilled,” he said. The aim is to hire the services of a quality attorney in a manner that is as easy as buying a toaster off Takealot. For services which are not readily listed on the website, users are also able to request a custom quotation from Legal Legends to render the services. The services leverage off of technology as much as possible, for many of their custom agreements are based on a user’s preferences as answered in an online questionnaire and a partly drafted agreement is automatically generated. After the form filling the agreement can be refined by the panel Attorneys. This increases efficiency and ultimately lowers the cost to the users. Legal Legends also offers certain intelligent templatised agreements which are automatically compiled according to the preferences of a user, and delivered to a user’s inbox. To further make the services accessible to small businesses, they have introduced various interest free instalment plans to allow small businesses to pay for the services over a period of as much as 6 months. During the course of last year, Legal Legends entered a prestigious international legal start-up competition run by the Hague’s Centre for Innovating Justice (Hiil) which consisted of around 450 legal start-ups from around the world and a 7 to 8-month gruelling selection process. They were selected as one of the 10 award winners, which eventually resulted in Legal Legends obtaining grant funding from Hiil, as well as sponsored office space, mentoring and certain back office support. 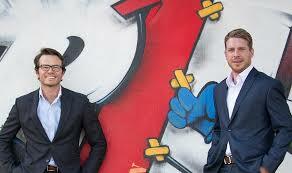 The founding members of Legal Legends are Andrew Taylor and Kyle Torrington, both practicing lawyers in South Africa.